First there was panic, then bluster. The alert the U.S. military gave Russia on Thursday of an upcoming cruise missile strike was quickly circulated by Russian officials to their Syrian counterparts. Fearing the al-Shayrat air base might not be the only target, many fled Damascus or hustled their families out of the Syrian capital, according to a Syrian businessman with links to the government of President Bashar al-Assad. The reaction, he told VOA, was much the same back in August 2013 when Assad loyalists had expected then-U.S. President Barack Obama to match words and deeds and order airstrikes on government targets in the capital as punishment for the use of sarin gas on a rebellious Damascus suburb. As the sun rose Friday in Damascus and the cruise strike appeared to be over, panic turned into bluster. Syria's information minister, Ramez Turjman, shrugged off the strike. FILE - This Oct. 7, 2016, satellite image released by the U.S. Department of Defense shows the al-Shayrat air base in Syria. The U.S. blasted a Syrian air base with a barrage of cruise missiles on April 7, 2017. "I believe this strike was limited in time and space, and it was expected," he told Syrian state television in a phone interview. 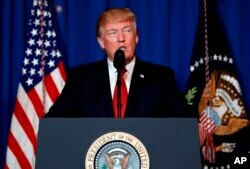 State media relayed a terse statement from the country's military command, accusing the United States of an outrageous act of aggression as it confirmed the missile strike had targeted an air base in central Syria, "which had led to losses." The governor of Syria's Homs province, Talal Barazi, also interviewed on Syrian state television, and again by phone, said the strike and any further targeting by the U.S. wouldn't divert the government. "Syrian leadership and Syrian policy will not change," he said. In its broader outlines, say analysts, maybe the war policy of the Assad regime won't be changed because of one barrage of 59 Tomahawk cruise missiles. But at the very least, it will give the regime pause before using chemical weapons again, says Charles Lister, an analyst at the Middle East Institute, a Washington research institution. Like other analysts, Lister argues the dynamic in Syria has been shifted. While the intervention — punishment for the alleged use earlier this week of sarin gas by the government on a town in Idlib province that left more than 80 dead and hundreds injured — may have been limited, he says, the strike is "a big development." "Regional states will feel empowered to re-back opposition" to Assad, he added. It also leaves Damascus guessing about whether the missile strike is just a warning, or marks a turning point. And U.S. officials appear to want to keep the Assad government off balance. Navy Capt. Jeff Davis, a Pentagon spokesman, told reporters Friday that he hoped Assad's government had learned a lesson but added it was ultimately "the regime's choice" if more U.S. military action would be needed in the future. For all of the regime's bluster, the attack on al-Shayrat will have hurt militarily, say analysts. While the full scale of the damage that was inflicted by the U.S. remains unclear — U.S. officials say they are still assessing the results — it does appear extensive. "The places we targeted were the things that made the airfield operate," said Davis. A pro-Assad Emirates-based news outlet, al-Masdar, reported that cruise missiles struck both runways and a hangar. It said that 15 fighter jets had been damaged or destroyed and that fuel tankers exploded, causing several large blasts and a massive fireball that was still raging several hours after the strike. In this photo made from the footage taken from Russian Defense Ministry official website April 7, 2017, an aerial view shows shelters for aircraft at a Syrian air base after it was hit by U.S. strike in Syria. Some reports suggest that at least one of the two main runways is now unusable. Turkish presidential spokesperson İbrahim Kalın talked about "the destruction of al-Sharyat air base," saying Friday in Ankara, "It marks an important step to ensure that both chemical and conventional attacks against the civilian population do not go unpunished." The Syrian Observatory for Human Rights, a Britain-based watchdog that relies on activists on the ground for its information, says the base, which covers an area more than eight square kilometers and has two runways as well as dozens of buildings, silos and storage facilities, was "almost completely destroyed." The attack damaged more than a dozen hangars, a fuel depot and an air defense base, the observatory said. If true, then the Syrian military will feel the loss of the base and likely face a severe challenge in the coming days in operations in northwest and central Syria. Al-Sharyat has been crucial in recent weeks in the regime's efforts to repel a rebel offensive in Hama. For the opposition, the missile strike holds out the hope that its cause is not totally lost — despite U.S. Secretary of State Rex Tillerson telling reporters that the strike did not mean the wider U.S. policy on Syria had changed. The Syrian National Coalition, the main political opposition group, welcomed the U.S. attack, saying it puts an end to an age of "impunity" and hoped it was just the beginning. Questions remain about what the consequences of the attack will be. If it is a one-only action, then it may only limit the Assad government's use of chemical weapons and nerve agents. However, analysts — and no doubt regime strategists, too — are trying to fathom whether the strike will draw the U.S. deeper into the Syrian war. Will other red lines be drawn by the Trump administration, for example, when it comes to barrel bombs being dropped on civilians? FILE - U.S. President Donald Trump speaks after the U.S. fired a barrage of cruise missiles into Syria Thursday night in retaliation for this week's gruesome chemical weapons attack against civilians, at Mar-a-Lago in Palm Beach, Florida, April 6, 2017. And what will be the impact on the effort by the U.S. and its allies to expel Islamic State fighters from the terror group's de facto capital of Raqqa? U.S. airstrikes on IS, and a ground presence of hundreds of U.S. Marines and special forces in northern Syria, have benefited from an arrangement among the U.S., Russia and Syria established to avoid their warplanes tangling in the crowded airspace over northern Syria. The Kremlin said Friday it is suspending an air safety agreement with the U.S. in response to the missile strike, and the Russian military announced it is reinforcing Syrian air defenses. Other uncertainties are thrown up by the cruise strike. Alberto Fernandez, a former U.S. ambassador, warns there could be an impact in the battle for Mosul, Iraq, and says "Iraq bears careful watching. "That is where Iranian proxies could orchestrate a response," to the U.S. cruise attack, he said. Iran, a staunch Assad ally, condemned the U.S. missile strike, warning it was "dangerous." Mosul is Iraq's second-largest city. IS militants took control of Mosul in 2014 and, in October of last year, Iraqi military forces launched an offensive to retake the city.